The star students of Nelson and Colne College’s unique partnership with Burnley FC in the Community have been honoured at an annual awards night. 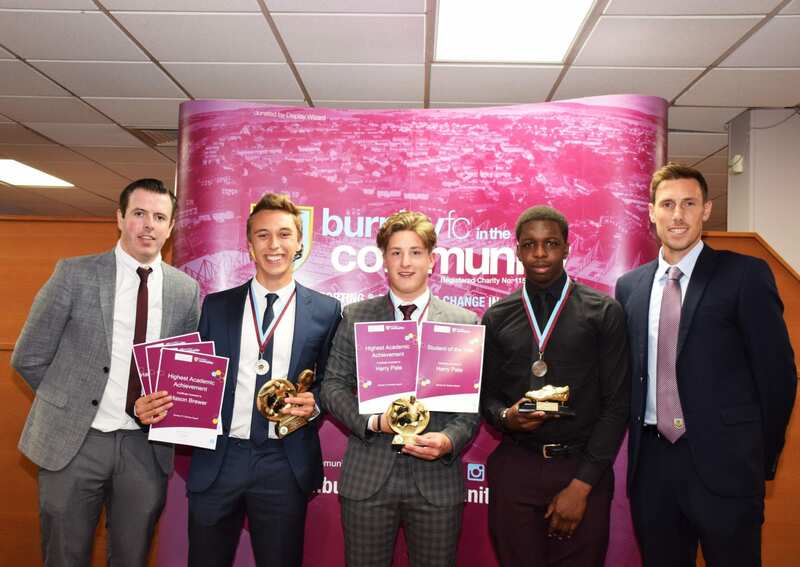 The BFC Shadow Youth Team Awards Ceremony saw sporting success and academic excellence celebrated in style in the Premier League surroundings of Turf Moor. The reach of the programme has also extended, with students being welcomed from further afield including Greater Manchester, the Isle of Man, Leicester and Merseyside, and NCC’s partnership with BFC in the Community is extending further still in 2017/18, with the development of the Girls’ Academy, open to any female student on a course at the college. Charlie Moss, Head of Division for Sport at Nelson and Colne College, said: “I’m very pleased to see the progress that the BFC Shadow Squad has made since its creation in 2015 and it was fantastic to be able to celebrate the achievements of the students who have all worked really hard in 2016/17. “The quality of the programme is improving every year, and this is down to a combination of the standard of players increasing and the programme being strengthened on the teaching side too. I would like to take this opportunity to thank the coaching and teaching team who have worked tirelessly throughout the year with the students. Chris Andrews, Head Coach of the Burnley FC Shadow Youth Team, said: “The Shadow Youth Team awards evening held at Burnley’s Turf Moor Stadium was the perfect way to celebrate the player’s footballing and academic achievements for the 2016/17 season. “This was the first group of players to graduate having spent two years on the programme, and there was plenty to celebrate! Numerous players have secured university places while others have progressed into semi-professional football and some into community coaching.